When the Southern Railway re-equipped its premier passenger trains in the post-World War II era, two of them, the Crescent and the New Royal Palm, included five double-bedroom observation lounge cars. The Crescent, of course, was the flagship of the New York-New Orleans route, and the Palm connected points in the Midwest with Florida, running on Southern’s tracks between Cincinnati, Ohio and Jacksonville, Florida. Pullman-Standard delivered eight observations for these services, configured like those of the New York Central’s “Twentieth Century Limited”, with raised “lookout lounges” in the observation end, accompanied by extra-large windows for better viewing. Those for the Southern’s services bore stainless steel fluting on the sides, rather than the smooth, painted surface of the Century’s equipment. Since both routes involved interline services, four other railroads in addition to the Southern participated in the equipment ownership: the Louisville & Nashville (2 cars) and Western of Alabama (1 car) on the Crescent; the New York Central (since initial service on the Palm ran through to Detroit) and Florida East Coast each obtained a single car, with the Southern providing the other 3. Interestingly, with the exception of the FEC’s car, which was (and still is, as one of the road’s business cars) named “Azalea”, the other seven all had names beginning with the word “Royal”. (Not that many years later, another transportation company focused on the south would also utilize the blue-blooded word as the identification of its premium service when Delta Air Lines launched “Royal Service” in the mid-1950s.) Over time, the fleet of observations suffered significant attrition; the NYC car was wrecked while leased to the Union Pacific in the early 1950s, and all three of the Southern’s cars were converted to 11 double-bedroom sleepers, sans observation ends, in 1958. Subsequent to use on the Crescent, the L&N’s cars (“Royal Canal” and “Royal Street”) operated on the overnight Gulf Wind between New Orleans and Jacksonville. In the late 1960s, these two also carried the markers on the New York-Miami Florida Special for one winter season. 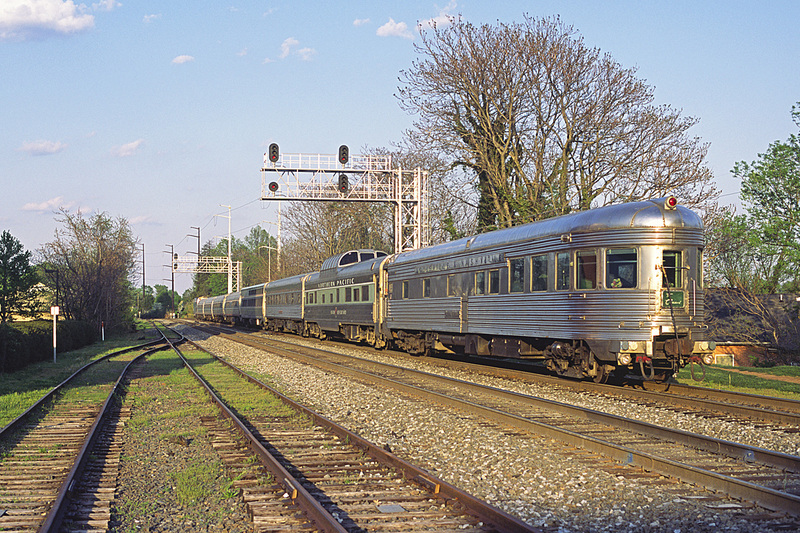 While neither of this pair was selected for Amtrak’s initial “heritage” fleet, when the National Railroad Passenger Corporation began operations in 1971, “Royal Street” eventually migrated into private, including charter, service such as seen here, on April 27, 2007, at Manassas, Virginia, complete with a Southern Railway green Crescent tailsign. While it’s actually trailing Amtrak’s eastbound Cardinal here, the route between Orange, Virginia and Alexandria, just south of Washington, DC is former Southern Railway territory, and it’s likely that “Royal Street’ had traversed this path many times while bringing up the rear of the Crescent. 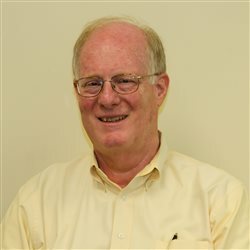 Of course, during the 1950s, the Crescent didn’t deign to stop in Manassas; only locals and through trains of lesser status such as the Peach Queen and Piedmont Limited were assigned the task of serving what was still essentially a small country town. Today, a greatly-expanded Manassas is a regular, not a flag-stop, on both Amtrak’s Crescent and Cardinal, as well as the Virginia-supported Northeast Regional to and from Lynchburg, which will be extended to Roanoke as of the end of this month (October, 2017). Apparently, you can go home again, at least occasionally, if circumstances (the right private car on the proper Amtrak route, or portion thereof) permit. In any case, some nice virtual history in tangible form, and for fans of the postwar streamliners, a sight for sore eyes, indeed.